The humble hashtag explained | What you need to know about #! The hashtag is such an ingrained part of our culture now that it’s rare to find someone uninitiated. Some people even speak in hashtags. But – like the occasional Dad you encounter who’s never heard of Beyonce – we know you’re (still) out there! In honour of the hashtag turning 10 this year, allow us to explain the basics. The birthplace of hashtags was in fact Twitter, where originally they were a metadata symbol used to categorise the huge volume of content coursing through that platform. Since those days, hashtags have really taken off! They’ve been taken up by social media as a whole – not just coders. What is the point of hashtags? Basically, the hashtag categorises content on social media and helps people find posts and pics. It makes your own content discoverable and allows you to search for relevant content from other people and businesses. The hashtag also allows you to connect with and engage other social media users based on a common theme or interest. How can hashtags help brands? Sounds great, doesn’t it? Hashtags can be very effective – if you observe a few simple DOs and DON’Ts. Do use hashtags only on posts/Tweets relevant to the topic. Make sure keep tabs on your hashtagged posts to comment, like and say thanks to your community! You can also leverage the power of oft-searched hashtags to encourage awareness and engagement. Do pre-populate a hashtag before you send it out into the world. When you make a brand-new hashtag for your business, make sure you edit your existing posts to include the hashtag. Then when users search it, there is already content there! Do raise awareness of your hashtag by listing it on other marketing materials. This helps make your hashtag synonymous with your brand. Typos abound in the world of hashtags, which unfortunately renders them useless. Don’t string too many words together in a single hashtag. Keep them short and sweet or at least clear. Don’t #spam #with #hashtags without strategy. Don’t separate hashtags with commas when spaces will do. Don’t use too many hashtags in one post. You can use up to 30 but we wouldn’t recommend it unless there’s a good reason. Don’t use overlong or complex hashtags. When it comes to hashtags, simple is best. Remember, this is the internet. 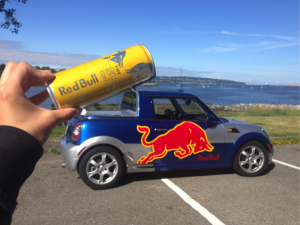 Who could forget Red Bull’s #PutACanOnIt campaign, when social media users around the world began posting pics like the below? Not a hard sell, just a bit of fun to promote awareness and goodwill towards the brand. In the wake of Sydney’s Lindt Café terrorist attack and subsequent backlash towards Muslims in 2014, a moving campaign emerged with #illridewithyou. Tourism Western Australia’s catchy #justanotherdayinwa unfortunately got hijacked by disgruntled residents. For instance: ‘Why does nothing in Perth open before 11am on a Sunday? #justanotherdayinwa’. Any questions about how to use hashtags in your marketing strategy? Contact Sketch Corp.